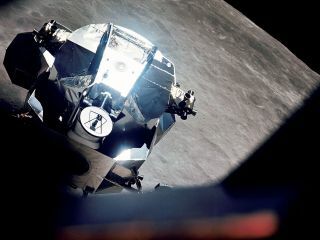 The ascent stage from Apollo 10's lunar module "Snoopy," as seen orbiting the moon in May 1969, is the focus of a new search involving astronomers and students. A group of amateur astronomers in the United Kingdom, assisted by students and NASA, have set their sights — and robotically-controlled telescopes — on a long lost dog: the U.S. space agency's lunar module "Snoopy." Launched in May 1969 on the Apollo 10 mission, a dress rehearsal for the first manned lunar landing two months later, Snoopy and its companion Apollo command module "Charlie Brown" were named after "Peanuts" artist Charles Schulz's comic strip beagle and his boy owner. The Apollo 10 crew, Thomas Stafford, Gene Cernan and John Young, chose the cartoon characters as their mission's call signs and unofficial mascots. When its test flight was over, Snoopy was divided into its two sections. The descent stage, which on later landing missions would remain on the lunar surface, was allowed to crash into the moon. The ascent stage, which included the crew cockpit, was jettisoned such that it entered orbit around the sun. All of the other Apollo lunar modules' ascent stages were purposely destroyed, either by burning up in the Earth's atmosphere or crashing back onto the moon. That makes Snoopy the only once-manned U.S. spacecraft still in outer space without a crew. Forty-two years later, it is still out there — somewhere — waiting to be found. The Faulkes Telescope Project hopes to do just that. Based at the University of Glamorgan in Wales, the group provides free access to robotically-controlled telescopes to engage teachers and students in research-based science. "To say it's like finding a needle in a haystack is doing a disservice to the haystacks," Paul Roche, director of the Faulkes Telescope Project, said in a statement. "Whilst there are records of the last known movements and orbital information for Snoopy, this is going back over 40 years. The module has been affected by the gravity of the Sun, Earth and moon for all that time, then you have all sorts of other factors that mean we need to search a very big chunk of sky for this thing." "To paraphrase President Kennedy, we are trying these things 'not because they are easy but because they are hard' — this will be a real test for the hardware and the students involved," Roche said. The project, which has received consultation from NASA's Jet Propulsion Lab and from former flight controllers who staffed Mission Control, will be attempting to post regular coordinate data that teams will examine on a daily basis. The Apollo 10 Command and Service Modules (CSM) are photographed from the Lunar Module (LM) after CSM/LM separation in lunar orbit. Comprehensive wide field sky surveys that were looking for near-Earth objects — asteroids that come within about 3 million miles of Earth — have previously failed to find Snoopy. The team however, has been encouraged by their recent success finding many small, faint asteroids. "Whilst there is every chance we won't find it, it's like the lottery — unless you play, you don't win" said Nick Howes, an astronomer and equipment consultant for Astronomy Now magazine. The challenge of finding Snoopy was just what Howes, a long time fan of the Apollo missions and a member of the Faulkes team, was seeking. "After the fantastic media coverage and work experience that student Hannah Blyth gained in helping us find over 25 new asteroids, we thought this would be an exciting way to engage schools" he said. Blyth, 18, made headlines late last month after one of the asteroids she discovered using a Faulkes telescope was proposed to be named for her ("Hannahblyhe"). Howes is hoping to ride that success by crowd-sourcing the search for Snoopy, just as another computer-assisted astronomical search first did more than a decade ago. "We are looking at this like SETI@Home, the search for radio signals from ET," he said. "The chances of finding anything in that are tiny, but millions of people tried." "With our Snoopy project, we hope to involve hundreds of schools users, plus the aside of most likely uncovering dozens of new asteroids and maybe some comets in our search areas means we'll be doing great science at the same time," Howes said. Continue reading at collectSPACE about what the Faulkes Telescope Project hopes to find in addition to Apollo 10’s lunar module "Snoopy."